There were huge cheers from environmental campaigners outside the council chamber in Carlisle when the decision was announced. The 10 members of the county council's cabinet voted seven to three against continuing with the plans. The decision effectively ends Cumbria County Council's four-year formal involvement in the process to find an underground repository for high-level nuclear waste. The Cumbria decision is a blow to the government's plans to expand nuclear power. Most experts consider nuclear energy essential for the UK's commitments on climate change. But the UK is not allowed to export nuclear waste, so clearly it will have to be stored somewhere under British soil. The question is where? Cumbria was the only county council still considering hosting an underground waste dump. Now the government has either to persuade another council to risk the wrath of its citizens and invite in the diggers, or to hope that Cumbria can be induced to change its mind with more cash and more commitments on medium-term storage at Sellafield. Even if Cumbria does agree later, a safe geological store has to be found there - which is by no means guaranteed. Without firm plans for long-term storage for waste, the nuclear new-build programme will attract more criticism year on year. Council leader Eddie Martin said: "Cabinet believes there is sufficient doubt around the suitability of West Cumbria's geology to put an end now to the uncertainty and worry this is causing for our communities. "Cumbria is not the best place geologically in the UK and the government's efforts need to be focused on disposing of the waste underground in the safest place, not the easiest. "Members have remained concerned throughout on the issue of the legal right of withdrawal if we proceed to the next stage. "Cumbria has a unique and world-renowned landscape which needs to be cherished and protected. While Sellafield and the Lake District have co-existed side by side successfully for decades, we fear that if the area becomes known in the national conscience as the place where nuclear waste is stored underground, the Lake District's reputation may not be so resilient." Earlier the authority ruled out Allerdale Borough Council's own vote on the issue, whilst Copeland Borough Council had voted in favour. Dr Ruth Balogh, nuclear issues campaigner for West Cumbria and North Lakes Friends of the Earth, said she was "absolutely delighted". "Our representatives have truly represented the communities of west Cumbria and voted against this option," she said. "The problems of nuclear waste and where to put it is a UK problem and should not be pushed onto the people of Cumbria." Leaders of Copeland Borough Council had voted six to one in favour of moving to the next stage, but could only proceed if the county council also agreed. However, Copeland council leader Elaine Woodburn said the authority would be writing to the government confirming its willingness to "go it alone" and seek out a suitable underground site. Ed Davey, Secretary for Energy and Climate Change, said: "While the decision to withdraw is disappointing, Cumbria will continue to play a central role in the energy and nuclear power sectors. Media captionEddie Martin, Cumbria County Council: "Would anyone come to Cumbria if you were even thinking of building a nuclear waste storage facility here?" "We are clear that nuclear power should play a key role in our future energy mix, as it does today. "I am confident that the programme to manage radioactive waste safely will ultimately be successful, and that the decisions made in Cumbria will not undermine prospects for new nuclear power stations. "It is however absolutely vital that we get to grips with our national nuclear legacy. The issue has been kicked into the long-grass for far too long. "We remain firmly committed to geological disposal as the right policy for the long-term, safe and secure management of radioactive waste." Cumbria nuclear waste dump: What were councils considering? 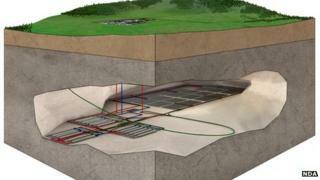 Nuclear waste disposal: Where in Cumbria to bury it?